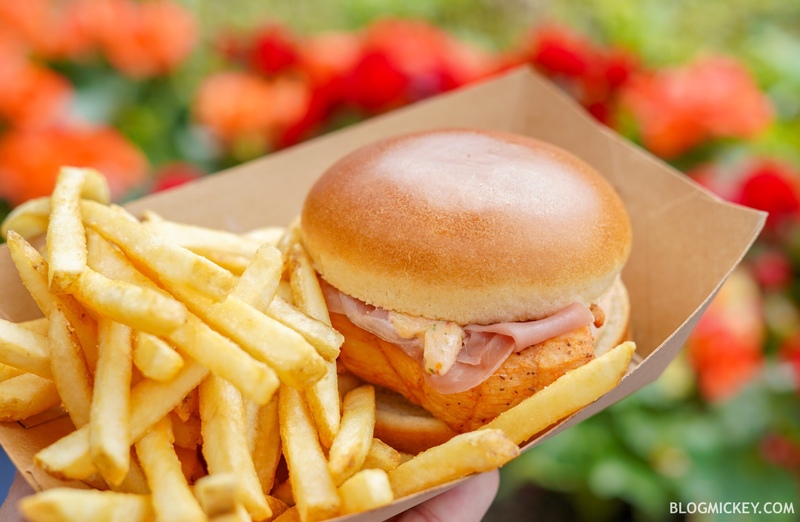 The Chicken Prosciutto Mozzarella Sandwich is topped with Sun-dried Tomato Aïoli and served with French Fries. We’ll start off by saying that we received a nice chicken breast. It was thick, perfectly cooked, and slightly juicy. 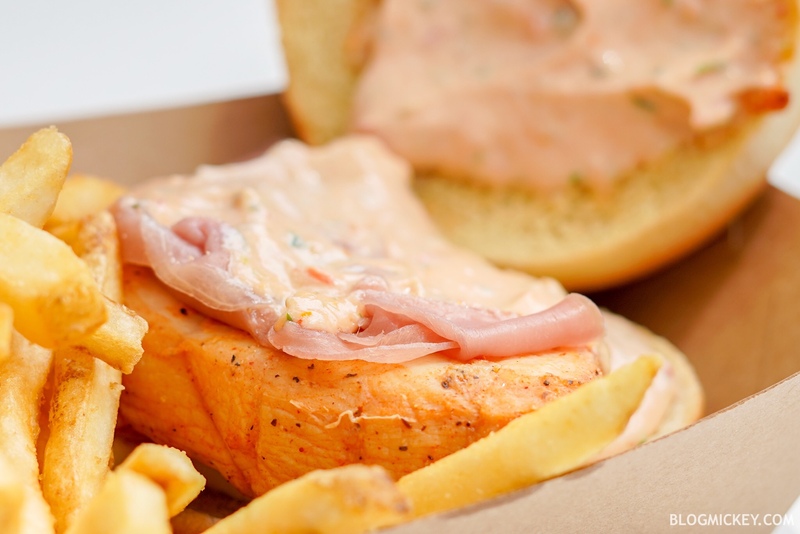 Of course, the wetness of the sandwich comes courtesy of the sun-dried tomato aioli. As you can see below, there was certainly a lot of aioli on the sandwich. 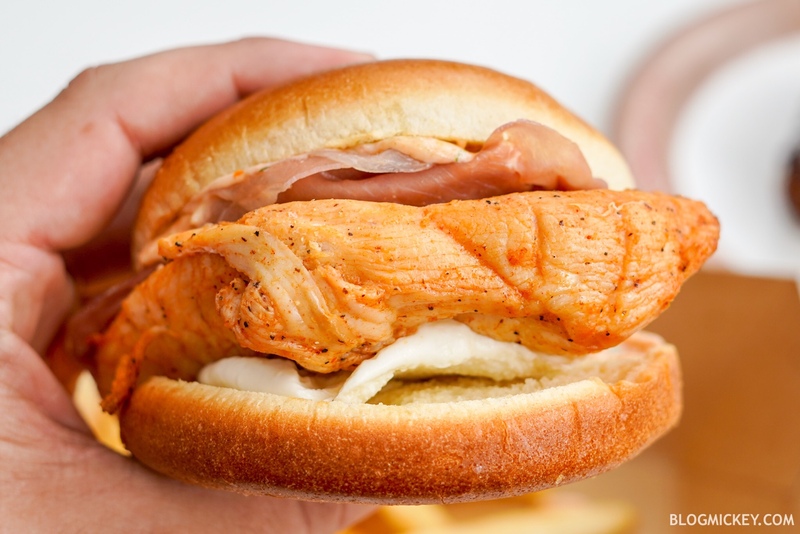 For whatever reason, it didn’t really stick out much on the flavor profile of the sandwich. I think the flavoring was nice and light, but perhaps lost behind the chicken and prosciutto. Speaking of the prosciutto, it was a nice, soft slice that I could see ending up on a charcuterie board. A surprising statement for Electric Umbrella, I know. Getting back to the aioli, it may not have been the star of the sandwich, but it paired really nicely with the french fries. The sun-dried tomato taste really came through. So much so that I found myself cleaning the side of the sandwich with fries to properly enjoy the meal. All that said, I think the aioli was really nice and light and just because it wasn’t in your face didn’t mean it didn’t work well with the sandwich as a whole. 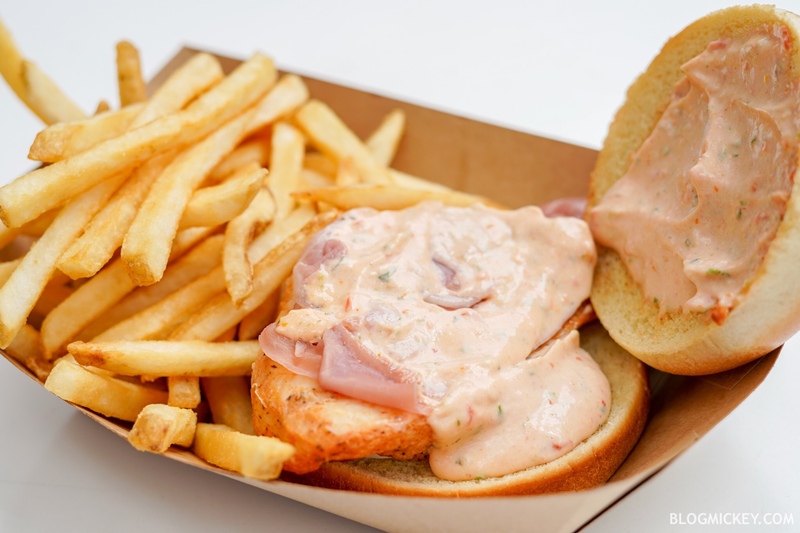 Overall, we can recommend this sandwich and think it’s a good option should you find yourself at Electric Umbrella. 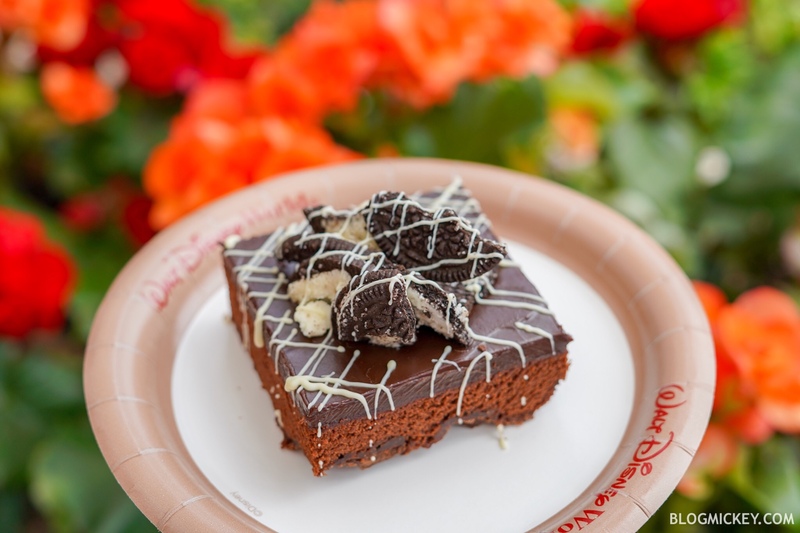 The Chocolate Cookie Crunch is a Chocolate Brownie with Chocolate Ganache topped with Oreo Cookie Pieces. Also new on the menu today is the Chocolate Cookie Crunch. We’ll start with flavor – it’s a chocolate overload. Unfortunately the Oreos on top didn’t provide the “crunch” as they were some of the softest Oreos I’ve had in my entire life. That wasn’t to say that they were bad, but your mileage may vary. Two well defined layers of chocolate exist here, the brownie and the ganache. 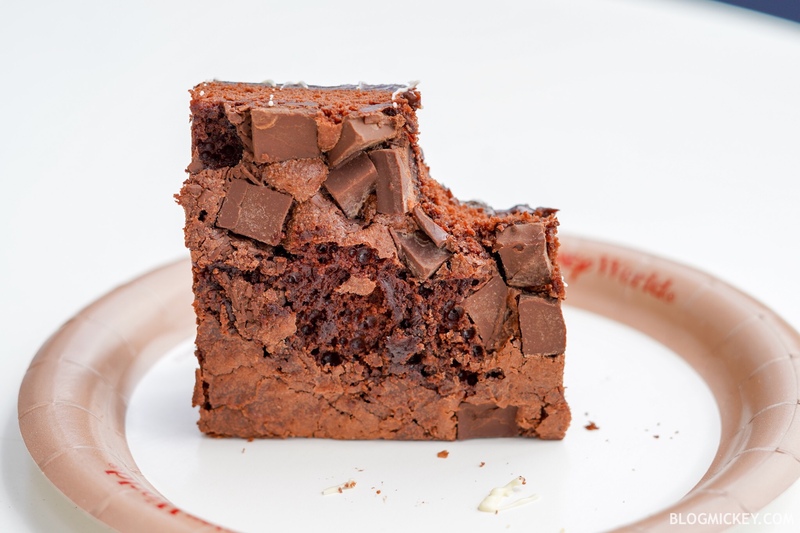 The ganache is creamy to the point of almost melting off of the side of the brownie. It’s prepared just perfectly so it holds its shape. By far the richest part of the dessert was this top ganache layer. 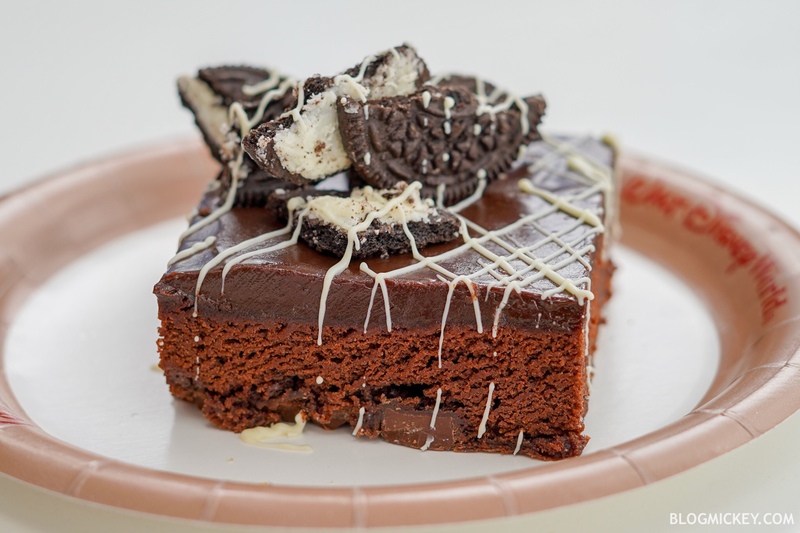 Once you got to the brownie itself, we were surprised to find chocolate chunks on the bottom! So surprised that we weren’t expecting it which is why there is the single bite in the photo below. Overall, if you’re looking for a borderline over chocolately dessert, this is your purchase. For us, we can pass on it as it ended up being too heavy to proceed with our day without the need for a nap after the sugar high.